There have been many studies documenting the uncharacteristically high intelligence of the octopus (for a mollusk, anyway), and it seems as though scientists continue to learn fascinating new things about the mysterious undersea cephalopod. 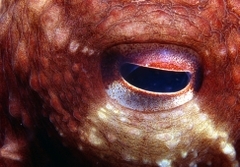 Most recently, it was discovered that octopuses can use their muscular tentacles to form basic joints while feeding. Bodily joints are defined by their degrees of freedom—that is, the types of motion they allow. The human elbow, for instance, has only one degree of freedom—up/down—whereas the wrist has three—up/down, left/right and circular rotation. An octopus' tentacles have infinite degrees of freedom, but when it comes to bringing food to their mouths, it's apparently easier to cut down on the tentacles' range of motion by briefly forming muscular one-degree joints.